The Viessmann Vitogas 050 is one of the popular Gas Fired Boilers in the Viessmann inventory. There are 8 models in this series; they range in MBH from 65,000 to 200,000 MBH. These boilers are considered mid efficiency boilers with a rating of 83% AFUE which stands for Annual Fuel Utilization Efficiency. The Vitogas 050 Series offers ranges of boiler sections between 3 and 6 depending on what size boiler you are looking for. 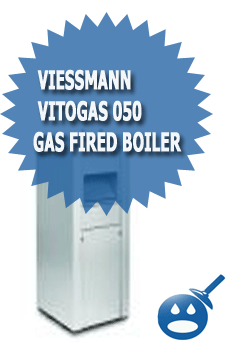 Viessmann Vitogas 050 Gas Fired Hot Water Heating Boiler is available for Natural Gas or Propane applications. The heat exchanger’s surface is constructed of a special high-grade cast iron material. The stronger the material the more life you have from the burner. With cast iron you will receive better service from the heat exchanger and that will keep the heat flowing to your home for many years.Some of the benefits of installing the 050 Gas Fired Boiler are that they are cost effective and can be installed in most basements or closets. The unit measures in at 19-3/4″ diameter, 13-1/2″ in width and 41-1/2″ in height. 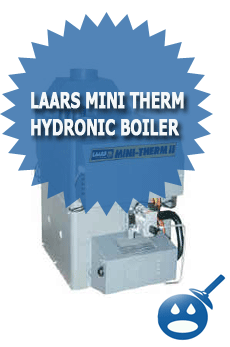 The boiler has large diameter stainless steel burners that allow the burner to run quieter than other boilers do. There are 2 venting options that come with the Vitogas 050 Gas Fired Boiler, the ECD has a motorized vent damper that is used for chimney venting and an ECV that has a built in power venting for a direct vent through the outside wall with one stainless steel vent pipe. To install the Vitogas 050, you will need 3″ or 4″ of venting materials. The maximum amount of venting that you will need to install the boiler if you are using 3″ pipe is 20 feet and if you are using 4″ vent piping then you will need about 30 feet. The Vitogas 050 comes with an intermittent pilot electronic ignition system and a power vent that is incorporated into the ignition. The Vitogas 050 uses a limited operation because the passageways that the water flows through the boiler are wider than other boilers. 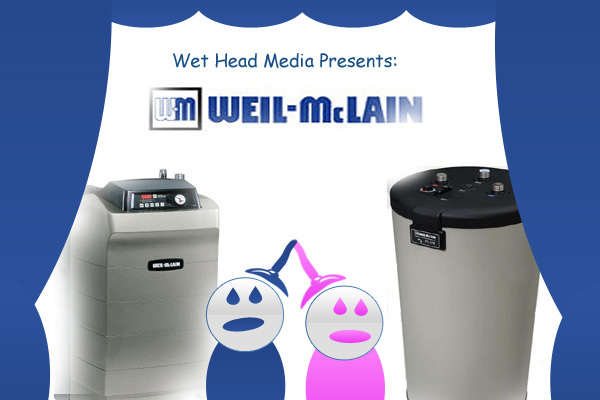 The boiler has a wet base sectional design, better than the standard boilers. You will need to check all connection sizes before you install, the boiler connections are 1-3/4″ male thread and the gas connections will be 1/2″ male thread connections. The maximum operating pressure of the Vitogas 050 is 50 on all 8 models. Also on all 8 models is a maximum gas supply pressure of 14″ WC. Most of the specs on the 8 models are the same if not similar, the only differences are the cast iron boiler sections, the burners and the heat exchanger surface area. As you choose the bigger boilers, the more boiler sections there are and the heat exchanger surface size gets bigger as well. Next time you are looking to replace a gas-fired boiler, look into the Viessmann Vitogas 050 Gas Fired Hot Water Heating Boiler, you won’t be disappointed. I am a residential homeowner. I have radiant floor heat and a Vitogas 100 boiler. It seems to work very well and we have had only a few issues during the six years since it was installed. But I would advise anyone considering a Viessman product that the depth of service, at least in Connecticut (and probably elsewhere) is not good. 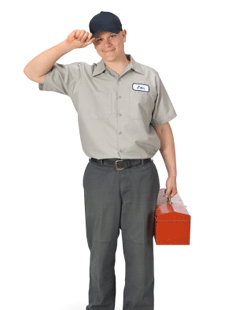 I have one service rep in my area and he is HIGHLY unreliable. I’ll leave it at that. So whenever I need advice, service, etc. I have to call in someone who will at least show up. Invariably they are not familiar with Viessmans. As a result I have had to become very familiar with the operating/owners manual to a depth that should not be required of a layperson. Think twice before purchase and definitely check out who can service it once installed. The regional distributor will call me back in five minutes if he thinks I am interested in buying a Viessman but won’t return my call if I need help with service.